Remember, nothing heroic gets done without support, without unity. We must back each other, we must support each other. Before you go out, look left, look right. Know that these people that are with you are your brothers… Boys, I wish you the best…Let’s go Boston Bruins. He’s an incredible guy, very energetic. He was humble. He was happy to be here…It was an honor to meet him…It’s something we’ll remember. McGregor is arrested after he allegedly smashes a fan’s phone outside a nightclub in Miami Beach. The fan, who has not been named, was trying to take photos of McGregor as he was leaving the Fontainebleau Miami Beach hotel, home to the LIV nightclub, just after 5am, when McGregor allegedly ‘slapped’ the phone out of the out of his hand and stomped on it several times, then picked it up and walked away with it. The fighter is facing charges of misdemeanor criminal mischief and strong-armed robbery. My mother’s 60th birthday party at the Versace Mansion. My mother has long been a fan of this fine Italian silk. In fact we are fans of all the Italian fabrics, my current August McGregor line is Italian wool. Cosy. Thank you for gifting me this life my mother! I love you with all my soul. Having a great time with my fellow Maltese’s at La Karnival Ta Malta. See you guys soon. McGregor and Conor Jr. arrive at the Super Bowl LIII in matching purple suits and are allowed onto the field to throw a ball around before the game at Mercedes-Benz Stadium. Heading home with my two healthy babies and an energized and healthy SuperMam. 2019 is off to the best start! Kavanagh admits he would need to be convinced to return to McGregor’s corner for particular fights going forward. 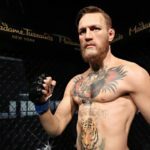 He does not want to see McGregor risk himself unnecessarily in second-rate fights, now that he is entering the final stages of his professional MMA career. He would certainly have to convince me to go again. I love him, I love the whole journey we’ve had but I’d need a good ‘why’. It might be [Nate] Diaz again because he promised that fight. It might be a rematch with Khabib. But if it was just: ‘Well, they want me to fight that guy’ I think I’d say, ‘I wish you the best. He has a wife and two kids now and I don’t want him taking more hits than he needs to. Khabib hit him with a punch in that fight that he has never been hit with in his career. And even Superman slows down at some stage. 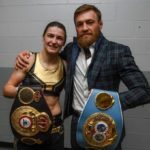 Nurmagomedov reveals he can imagine a reconciliation with McGregor, even after the bitter feud that marred their last title fight. 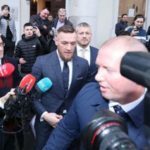 Both men are waiting on a December 10 hearing with the Nevada State Athletic Commission to find out if their actions will result in any further sanctions, but Nurmagomedov insists that he and McGregor may not remain bitter enemies. Everything is possible. Just as McGregor and I feuded, so we could reconcile…Who are we not to forgive one another when the Almighty forgives us? 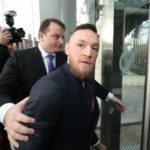 McGregor apologises for running out of his Proper No.Twelve whiskey. The company say they have “sold more cases in less than one month than many whiskey brands sell in a full year”, claiming hundreds of thousands of bottles sold. McGregor says he is sorry for the worldwide shortage and is personally making sure the company is ramping up production. I don’t usually see reason to apologise but in this case I want to take this chance to apologise to absolutely everyone for our out-of-stock situation. I was at the distillery last week and we have plans in place to be back in stock in Ireland and the United States in early December and onward. We are producing many hundreds of thousands of bottles now. 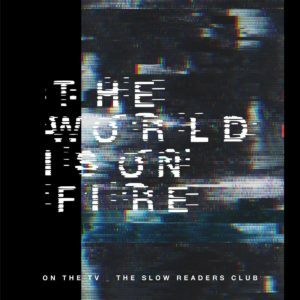 On The TV is a song about feeling a sense of discomfort, disassociation and extreme anxiety at the state of the modern world. It’s a scream against everything from caged kids at the Mexican border to the rise of nationalism in the UK and US. In the verses I seek solace in family and ask my parents for guidance. It also has a great riff. McGregor visited NFL franchise Dallas Cowboys as a guest of Cowboys owner Jerry Jones at the AT&T Stadium, to watch their victory over Jacksonville Jaguars. He engaged in the pre-match team talk and was also given the opportunity to throw the football. 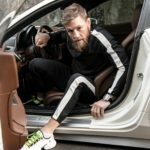 McGregor responds to the social media mocking of his football throwing technique by pointing out he wasn’t exactly dressed for the occasion. Hahaha yous’r f*****g ruthless on this side. I just didn’t want to rip my custom baby blue billionaire blazer. Great job to the Cowboys today! It’s a Proper giddy up tonight in Dallas and I LOVE IT, see yous soon.